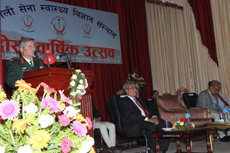 Nepalese Army Institute of Health Sciences (NAIHS) celebrated its second anniversary amid a special function organized at Bhandarkhal, Sanobharyang on June 2, 2014. COAS General Gaurav SJB Rana inaugurated the newly built Auditorium Complex in the NAIHS premises the same day. During the anniversary programme, the Chief Guest COAS Gen Rana lauded the NAIHS faculty members for their contributions in establishing the institute as one of the best upcoming ones in the health sector within a short span of time. 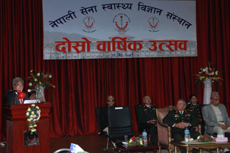 He emphasized on the Nepalese Army’s vision to provide international standard quality medical education in establishing the institute as 'Centre of Excellence’ in the field of Medical education in Nepal. He also added that College of Medical Polytechnic under NAIHS is expected to be functional from next academic year. He further added the future endeavours about increasing the number of medical students from 100 to 150, launching Post Graduate Training, Commencement of Dental College and Construction of ‘Veterans’ & Civil Hospital’ in near future. He heartily praised the NAIHS-College of Nursing for being selected as the best Nursing College by Council for Technical Education and Vocational Training (CTEVT). In the function, Maj Gen (Retd.) Dr. Prakash Raj Pande, Executive Director NAIHS, presented the annual report highlighting the achievements of the institute and its forthcoming projects. Prof. Dr. Hira Bahadur Maharjan, Vice-Chancellor Tribhuvan University and Prof. Dr. Damodar Gajurel, President Nepal Medical Council (NMC) also shared their views during the programme. COAS Gen Rana awarded shields and certificates to the best students in the fields of academic and extra-curricular activities. Mr. Dhan Bahadur Shrestha, undergoing MBBS study (3rd year), was selected the overall best student to grab the ‘COAS Excellence Gold Medal Award’ and a cash prize of NRs 50,000. Present on the occasion were Acting Defence Secretary, retired Army Chiefs, Academicians, Heads of security organizations, serving Generals, officials of IOM, army officers, media persons, faculty members and the students of NAIHS. The guests were welcomed by Brig.General(Rtd) Prof. DR. B.K. Hamal, Deputy Executive Director of NAIHS and vote of thanks was delivered by Prof. Dr. Narbada Thapa, Principal of College Of Nursing.